Our slogan is Little Legs Love Baby Emporio for a reason! 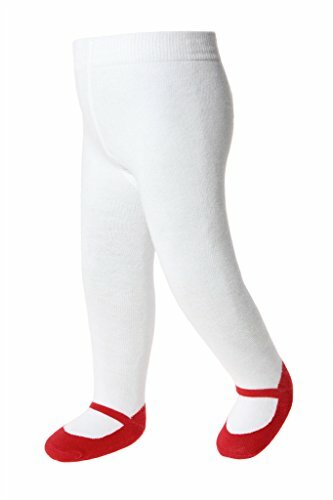 Whether for every day or for a special occasion, your baby girl will be warm and comfortable in our Baby Emporio medium warmth Baby and Toddler Girl tights with Shoe Look. Generously sized, they will last long as baby's feet and legs grow so fast! A beautiful look for the holidays and every day. We offer classic Mary Jane tights, Ruffled Mary Jane tights and our newest line of soft Sparkle Mary Jane tights with satin bows and just a touch of glitter. Grippers are added to the bottom of the soles to help keep her upright when she starts to crawl or walk. The anti-slip color pattern is a color match to the soles of the tights, so just barely visible. Gone are the days of elastic waistbands that feel tight and uncomfortable. Ours are 1 inch tall and very soft and comfortable on your little one's skin.